a model based entirely on optometrists – such as in the United Kingdom – where optometrists are the primary eye care providers, is just as safe as a model based entirely on ophthalmologists – such as in France – where ophthalmologists are the primary eye care providers. in a country such as Germany, where optometrists and ophthalmologists currently share responsibilities, the provision of eye care would have collapsed if optometrists had not already taken on essential tasks in this area. This relates to the fact that currently in Germany around 73% of all visual aid prescriptions and around 67% of all primary care for contact lenses are carried out by optometrists. the clinical and academic training of an optometrist is considerably more cost-efficient than that of an ophthalmologist, since costs are up to two thirds lower. 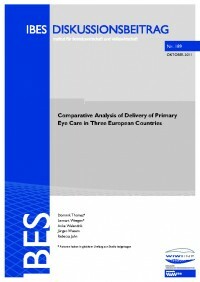 demographic change owing to an aging population is fundamentally leading to an increase in age-related eye conditions, which must be recognised and treated early; for “age-related macular degeneration (AMD)” alone, the authors of the study suggest an increase in Germany from 875,000 cases in 2007 to 1,769,000 by 2050; this in turn causes a need for more primary eye care providers in the future. a country such as France, where ophthalmologists have almost exclusive responsibility in this area, needs to see a clear increase in the number of primary eye care providers in the future owing to demographic changes and a decreasing number of ophthalmologists.